On April 9th, 2008, I posted a quiz about genetic genealogy here on the blog. (If you haven’t taken the quiz yet, it is available here; it only requires a few minutes and might make the following analysis more clear and personally relevant). I created and posted this quiz because I thought it was a fun way to interact with my readers, and because I thought it was educational material to share with others. As readers began to take the quiz, I realized that there was valuable information contained with the results. The following is an analysis of those results with a few preliminary conclusions. As I proceed, don’t feel bad about missing any of these questions, since this isn’t meant to be a critique of any single individual (especially since individual responses were not recorded). I merely hope to share the results as a whole in an effort to help inform and educate. The quiz was, and still is, meant to be fun. As of today, the quiz has been completed a total of 375 times. 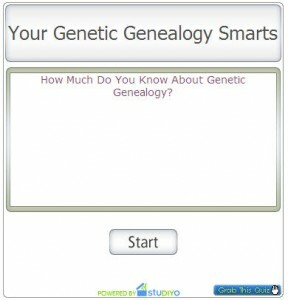 Most of the questions were easily answered, ranging from 80% correctly answered (“We all came from Africa, so why bother with a genetic genealogy test?” – Correct answer: Many things have happened in the last 100,000 years) to 97% correctly answered (“Genetic genealogy is a scam, created by big business to capitalize on consumer ignorance” – Correct answer: False). For some of these, the incorrect answers were probably a result of the ‘fun’ element I added to the quiz, such as creative (but less-correct) answers. Each question, however, had an answer that I considered to be the “best” answer. A1. True – heck, I’ve been doing genealogy for years. A2. True – after all, I saw it on TV. A4. Why would I have to research genetic genealogy? Although the service I used did not track which answers were selected, I have a feeling that many individuals chose “A1” rather than the correct answer of “A3”, under the assumption that experience with genealogy prepares an individual for genetic genealogy. However, the fact that a genealogist has been doing research for years does not mean that they should undergo genetic testing without prior research. The other incorrect answers, “A2” and “A4” are also problematic in that they suggest that either (1) TV reporting/coverage provides enough background information to fully inform an individual about genetic testing, or (2) that no research is needed for genetic genealogy. A3. My DNA knows exactly how much I weigh. A4. Genetics has nothing to do with my health information. Again, I am uncertain which incorrect answers were chosen, but “A2” and “A4” are essentially the same answer and suggest that there is no connection between a genetic genealogy test and genetic disease or health. “A3” is one of the ‘other’ elements I mentioned in the introduction (and my sorry attempt at humor!). A total of 1 out of 4 individuals was unaware that a genetic genealogy test can reveal medical information. I have previously highlighted this problem here at TGG, and I included it in both my eBooks (see the sidebar). Many people are unaware, for example, that a Y-DNA test, provided by some of the major genetic genealogy testing firms, can reveal male sterility. Additionally, a full mtDNA sequence can reveal any one of a number of metabolic or other genetic disorders. Although the percentage of these results is extremely low and I don’t think this should discourage people from genetic genealogy, I do believe that people MUST be aware of the possibilities BEFORE swabbing their cheeks. Today I received the following comment: “This quiz fails to distinguish between facts – you can get a test done without doing any research – and values – you should do some research first. Poor.” I have to admit that receiving this comment stung a little, but then I realized that the author of this comment served to perfectly reinforce the results of the quiz. A genetic genealogy test is a genetic test. Although it is not meant to detect genetic disease or reveal other secrets contained within the genome (such as adoption and illegitimacy), it is fully capable of doing so. As with ANY type of genetic testing, the tested individual must be aware of the possible outcomes before consenting to the test. Educating individuals about the possible outcomes of genetic genealogy is just one of the goals of the Genetic Genealogist. I have a feeling that my regular readers were among those that answered these difficult questions correctly. Thank you to everyone who took the quiz or wrote about it on their blog or newsletter. I hope you enjoyed taking it, and I hope you’ll consider taking future quizzes. To stay up-to-date on the latest in news and information about genetic genealogy and personal genomics, subscribe to my feed. Previous Article Kwäday Dän Ts’ìnchi – "Long-Ago Person Found"
Fun Quiz! I agree with Gene Sherpas, ancestory testing will reveal medical data. If anyone is trying to avoid being discriminated its important to work with trusted health care provider, and to always keep your medical records as private as possible.